We will be meeting at the West Newbury Town Hall Annex (at 381 Main St, West Newbury MA) from 10-12 on April 2 for our April guild meeting. We will have show and tell and a demonstration from Laura on curved piecing! If you would like to play along and practice drunkard's path blocks with us please bring the following: Sewing machine set up for piecing (1/4" foot is helpful if you have one), thread snips, pins, fabric scissors, rotary cutter, two or more contrasting fat quarters (that would go together in the same block). The Jelly Roll Race quilts were donated to the Rockingham County Nursing Home in Brentwood, NH and the Country Center for Health and Rehab in Newburyport, MA. Special thanks to Jess, Suzanne, Carrie and Barb for quilting and finishing these for us! Retreat - We will be having our annual retreat at the Franciscan Guest House in Kennebunkport from April 14-17th this year. The second payment is due by the 15th of March, to be paid via the Paypal button here. If you have any questions regarding retreat payments please forward them to Jessica. We are checking with the Franciscan about the possibility of day quilters and will get back to you! Amy Friend will be talking to us about her new book, Intentional Piecing at the May meeting. Find additional info here. Our fall workshop will be on October 8th, and will be a FMQ workshop taught by Christa Watson of Christa Quilts. The workshop will cost around $100 and will include lunch and the full day workshop. Guild members will be given priority for sign ups on a first come first serve basis. Keep an eye out for more info! The Riley Blake Fabric Challenge fabric has arrived! Almost everyone who signed up received their fabric today, and if you didn't you already have an email waiting for you! All of the details can be found here if you didn't sign up but would like buy the fabric and participate. The deadline for this challenge has been extended from April 30 to a yet unannounced date in the future. We will remind you as that gets closer! Nido, a shop in Burlington VT will be hosting Carolyn Friedlander in July for two full day workshops. Please contact them if you are interested! 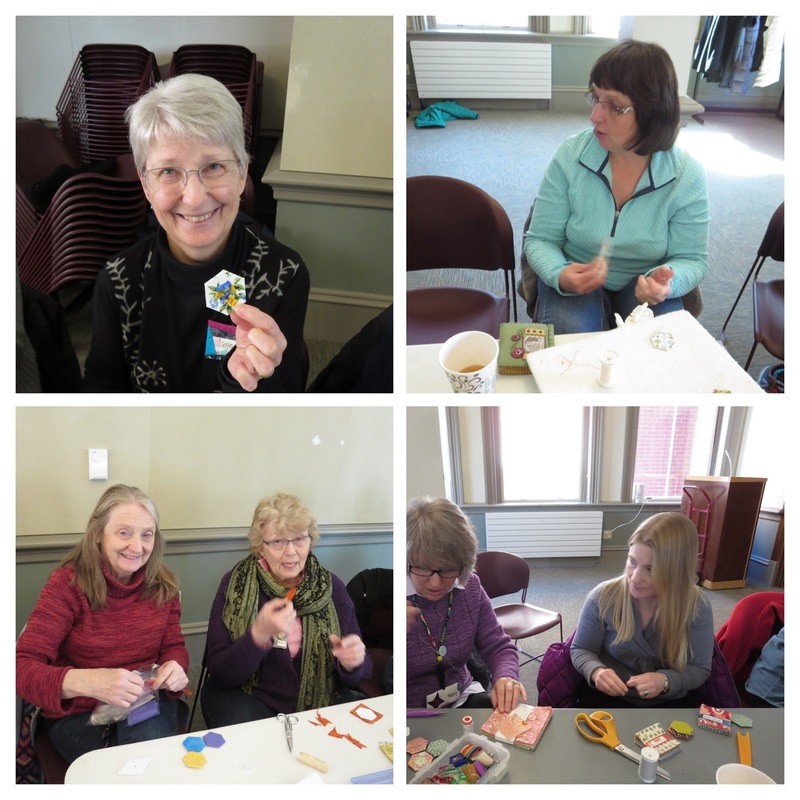 The Cambridge Modern Quilt Guild had their first meeting last weekend! Congratulations to them!! We look forward to seeing them grow and working with them in the future! We voted to accept the policies sent out last month. These will be listed on the blog soon. Finally, big congratulations to both Amy Friend for her 2nd place win in the Piecing Category at Quilt Con for her quilt Pointed Statement, and to Mary Gregory for quilting the 1st place quilt in the Negative Space Category for Nancy Purvis of Owen's Olivia! Way to go! 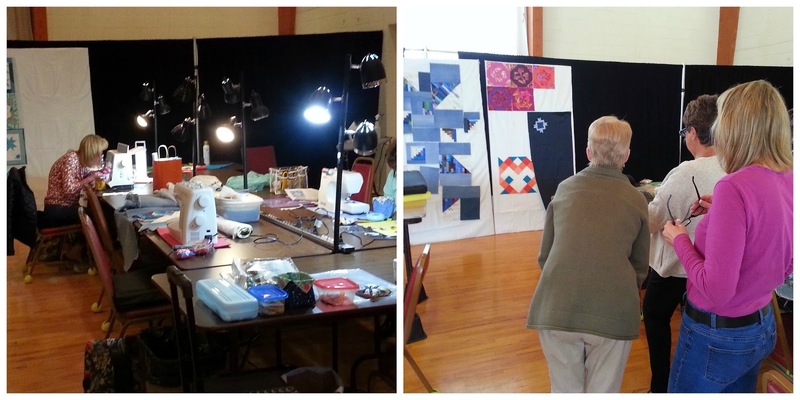 All of the winning quilts from QuiltCon can be seen here. Kate finished her Super Tote using Cotton and Steel Fabrics. She also showed off some vinyl project bags she made and she shared her discovery about being able to modify the pattern and having the skills to do so! Kali shared an almost finished Jacob's Ladder quilt. Laura finished this lovely log cabin quilt that if pressed she would name 20 40 60 100, derived form the proportions of solids to background fabrics she used. Mary O showed this finished quilt top made with log cabins and some cute applique hearts. Jane F shared some of her own EPP work with us. 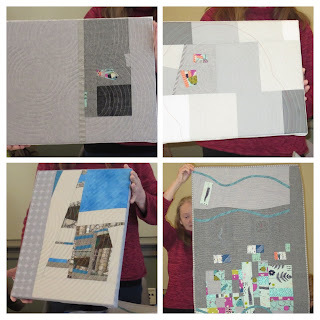 This project has been years in the making and uses scraps from many of her quilts. She also shared a great source of inspiration in the book Print and Pattern: Geometric. Susan showed this quilt that she is making for herself. The back was pieced and could almost double as a reversible quilt! Linda showed this quilt that she was working on binding. This is going to be a sample for a quilt class that she is teaching. She also mentioned a bus trip to the NY Garment District in May. Find more info here. Marylee shared this baby quilt that she is making for a family member. Paula showed off this heart pillow that has had much anatomical debate surrounding it. She used made fabric for her red pieces and used some crazy quilt inspired stitches for decoration. Paula also had this Norris Star quilt that she started many moons ago and has finished! Diane has derived much inspiration from the monthly Mighty Lucky Challenges and showed three minimalism works that she stretched onto canvas, and her finished bias tape challenge from January. Robin showed off this improv piece that she was working on. Suzanne also has been following along with the Mighty Lucky challenges and showed this as her minimalist piece. Amy shared this finished quilt that she was working on last month at our sew in. She was inspired by the ting log cabins in the fabric she was using and did some meticulous fussy cutting. Amy also passed along the "high five hand" Jane B for her enthusiasm! Nancy was finally able to show off this quilt that she made with a collection of friends all over the world. She mailed off the feather block with the request for rainbow colors, black and white, and a white background a few years ago and it has traveled and been added to by 13 other quilters who all each had quilts that they mailed around too. You can read more about Round Robin quilts here. Mary also showed off her minimalist Mighty Lucky challenge quilt. Mary gave us a demo on English Paper Piecing, or EPP. She recommends printing the shapes you need onto regular copy paper, then ironing freezer paper to that paper before cutting it out. The tip is to pre-shrink your freezer paper! (How crazy!) Iron the freezer paper shiny side down onto your ironing board cover, then peel up and iron to the wrong side of your printed copy paper. If you iron fresh freezer paper to the copy paper it will distort as the freezer paper changes. With these pieces they can be freshened up with an iron after using to better results than just regular paper. Our April meeting will be at the West Newbury Annex and will include show and tell and a curves demo by Laura. Please bring your sewing machine and basic sewing supplies to test out curves! So just like before pick from the drop down menu which room option you've already chosen. The Paypal button will be up until the 15th. And if you'd like to pay with a check, just send a quick email to Jess (jessicabenoitmay@gmail.com) so she knows what's happening.